Except when you have been held hostage for a ransom (or other similar situations), in under no other circumstance is leaving without warning a good conduct. This is especially true in the office setting. If you now feel that you are ready to finish up and to start anew with your career, formalize your decision by writing a two weeks notice to your boss or supervisor. 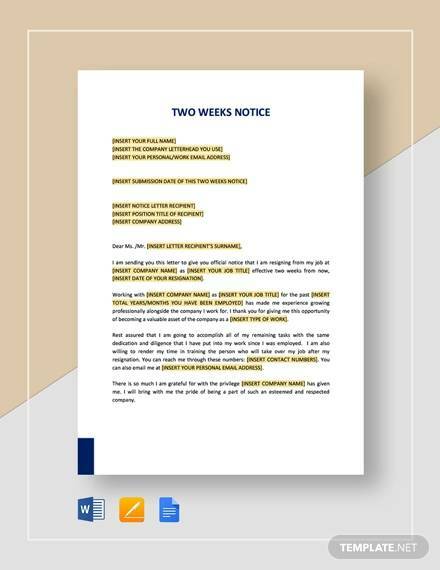 Format and write your letter with these Sample Notice Letters as reference. Doing so prior to resignations is not contained in all company policies. However, it is considered an industry standard, and a mode of professionalism—an unspoken rule, if you will. Companies that do lay out the standard operating procedures for resignations may also include a specific time frame. 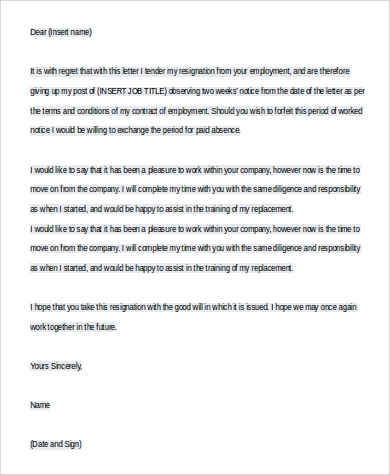 If a letter of resignation is all that your companies require, do note that the observed practice is to hand it in two weeks before your intended date of departure. 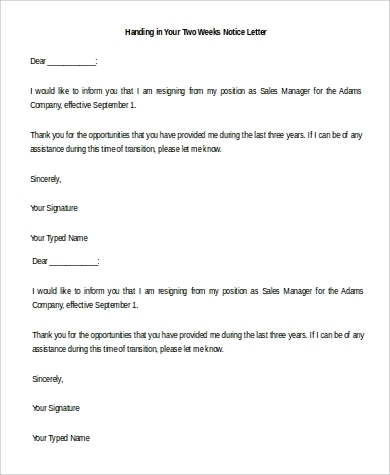 Format and write your letter with these Sample Notice Letters as reference. Say your reason for leaving is an overbearing and bitter work environment. As much as you might want to fling everything from your desk yelling “I quit!” and to push determinedly past the exit in the most movie-like way possible, doing so would not help you any. Mind over matter. Yes, you will be remembered and you will be talked about in your field, but for all the wrong reasons. In the workplace, it is important to always maintain professionalism. No matter what. You may have been dealt with unfairly and that is why you are leaving, but you always need to demonstrate graciousness, tact, and sensibility. In this field, word goes around very quickly, and a negative last statement from your previous employers could be to the detriment of your applications. You should never burn bridges. Hence, the two weeks notice. It is the document that triggers the procedures that must be undertaken for your resignation. The period should give you enough time to clear everything and should allow your office to make the appropriate adjustments. 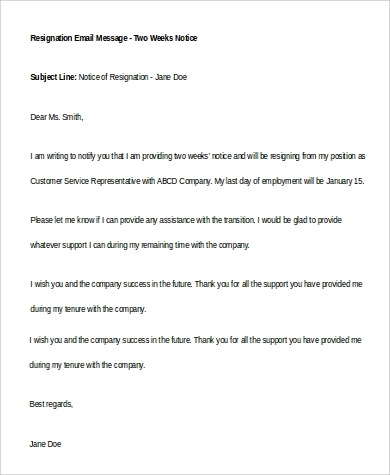 The best thing to do is to handle your resignation with both honesty and professionalism. Be honest about your reason for leaving; a better job opportunity, an inconducive work environment, or further studies. Express gratitude for the period that you were with the company, regardless of how bad your reason/s for leaving is/are. You can also write about memorable experiences, and etc. Recommend a person to fill in your would-be vacated position, or express desire to help in the transition for a new recruit. 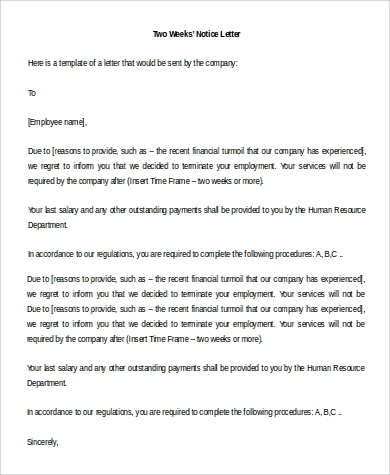 Alternatively, a notice that management can send out to employees is the warning letter. This is done as to reprimand members of the staff following the event of a breach from employee disciplinary measures. For the format, see these Employee Warning Notice Samples. On the more personal sphere, enforcement agencies will not eject you out of your home in a snap if you have been evicted. They will send out a notice, with ample time for you to make corrections, adjustments, and other arrangements. 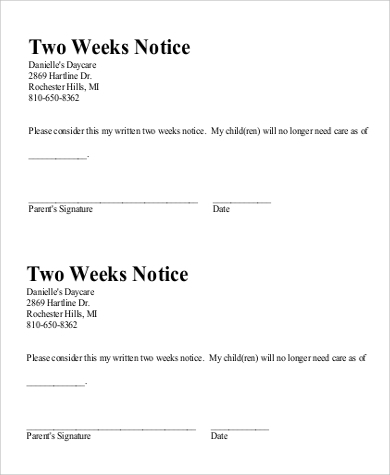 See these Samples of 30 Day Eviction Notice for the content.